The 139th Easter Egg Roll was held Monday morning on the White House lawn. During the CNN broadcast some kid photobombed Jim Acosta. 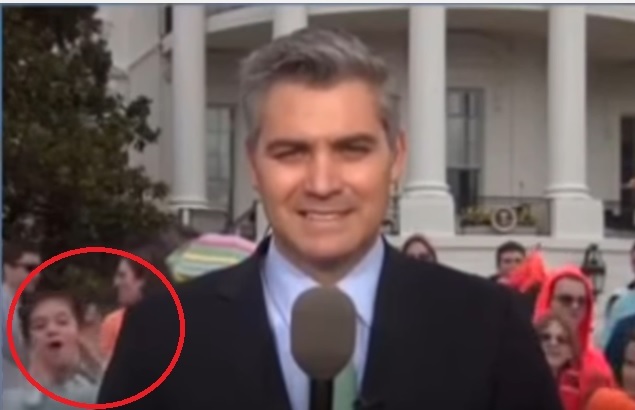 The kid appeared to mouth “fake news” behind leftie hack Acosta. During a live CNN report in the 11 am ET hour, a young boy photobombed correspondent Jim Acosta and mouthed something at the camera, twice. There’s no volume, so it’s difficult to make out exactly what he’s trying to say. Could it be “f—-you”? Or maybe “fake news”?